For the last 7 days we have been staying at a nice hotel called Langon Hotel and Resort in Nusa Dua. The resort is a little far from the beach, restaurants, and massage spas but the hotel provides transportation. 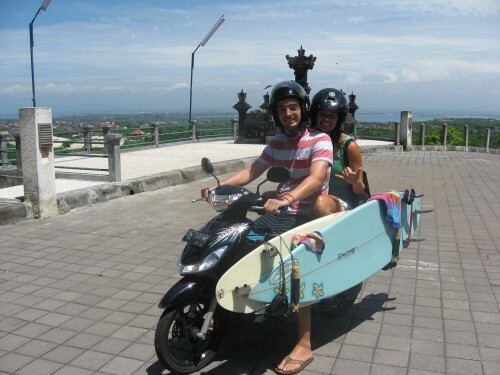 However, we choose to also rent a motorbike so that we could get around when we please. These pictures have been requested from a special lady, Alison, the expecting mother. It is wild to ride around town on these motorbikes. It was defiantly helpful that Sebastien had experience with his motorcycle before. Here are the crazy things we have found on the streets of Bali. Families of 4 ride around on these small motor crafts. I have seen babies being held by their mothers, who are sitting with both their legs on one side, and their 5 year old son sitting in front of the dad who is driving. Wild! None are wearing helmets. There doesn’t seem to be a driving age here. Very young kids who look to be 12 years old are driving around on these speed demons. You can cut across to the other side of the street, into oncoming traffic, if you feel that your lane is going to slow. There are more motorbikes than cars. Besides risking our lives everyday to be like a local we are enjoying our life here in Bali. Our daily routine consists of waking up around 9 ish. Going to breakfast (which is included in our stay) then spending time on the internet before heading down to town for lunch and a surf. We then return back to the hotel for a shower or to get ready for our daily massage before dinner. What a life! So glad to see that you are both wearing helmets!! Enjoy life! Be safe! We love you both! Voila! c’est là ou je voulais en venir! on a pas des vies faciles. et merci pour le rayon de soleil. “it is whatever you feel”. I guess you tell your insurance agent, “I felt strong so I went.” …… Hahahaha LOVE IT! When me and my sister went with out mom to Thailand, we convinced our mom to learn to ride a scooter and we took a scooter ride through chang mai. it was so much fun and my mom loved it. I think you two are really having a blast!